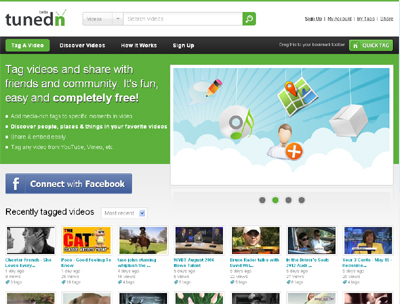 Tunedn is a patent-pending video tagging application service that allows users to learn and contribute information about content related to video. Kind of a like a Wikipedia for videos. Users can identify people, places, things and more related to video content. This is the first and only community video tagging service available. We allow for anyone and everyone to contribute tags to our growing video library. Additionally, our system is built on technology that allows us to create tags in HTML, outside of the Flash video, via API’s provided by video hosting providers.